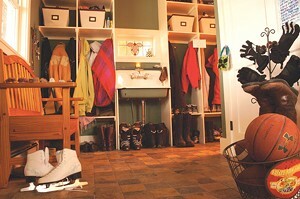 Multipurpose Mudroom | Habitat | Kids VT - small people, big ideas! 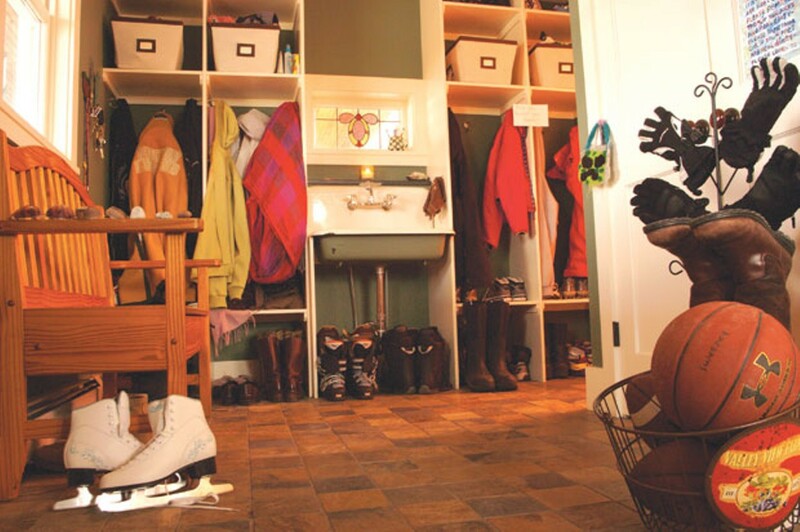 Builder Shawn Sweeney understands the importance of having a mudroom. He lives on a dirt road in Shelburne with two active sons and a wife who's an avid gardener. "The mudroom gets hit hard every day, no matter what season it is," he says. He designed the space — between inside and out — that prevents all manner of dirt, mud, slush and snow from being tracked into the actual house. Form blends with function in this attractive room that features a vintage stained-glass window — a gift from the in-laws — a multicolored slate-tile floor and a reclaimed enameled laundry sink. Best of all: It looks good even when it's muddy. Each family member has his or her own cubby. Shoes are stored under each of the cubby seats. Upper shelves hold helmets and gear. Brooms and a vacuum cleaner are tucked out of sight in a coat closet. The sink gives the boys a place to wash their hands or soak muddy items. A pane of glass mounted on the exterior of the stained-glass window keeps in the heat. Slate flooring is extremely durable and helps hide dirt.